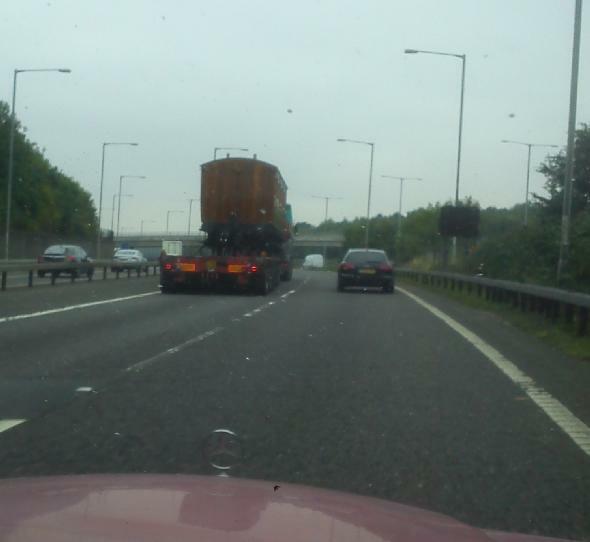 In August 2008 I made this blog posting about a train on a low loader spotted on the M25. I had spotted another train since, but the photos were too poor to use. Yesterday I was on a rather twisting slip road to join the M25, when a lorry took my notice – or rather its load. I soon realised it was an old-fashioned (that is to say over 100 years old) railway carriage. I was able to get the above shot, but any attempt to get one closer was too hazardous to try, what with the speed, the traffic around me and the complex shape of the slip road. Note the opposing traffic is on the left at this point. All the exterior of the carriage was wooden, and well varnished. I was able to see that the carriage was marked “Metropolitan Railway”, clearly denoting it as one of the fleet of carriages used on what is now (mostly) the Metropolitan line of the London Underground. This carriage would have dated back to the time when the Metropolitan Railway was an independant company, which had ambitions to have a very fast train line from points North, via a gap in the Chilterns, through London and to a Channel Tunnel. Much of the ambition became the Great Central Railway, with the last-built London terminus at Marylebone. It’s no wonder the HS2 consortium want to use the same idea. Shame they’re one hundred years too late. The Great Central is defunct, the remains are commuter lines into London from the Chilterns, although Deutsche Bahn owned Chiltern Railways have pushed faster trains to Birmingham. £50bn to save 20 minutes or so London – Birmingham? If they really want to increase capacity, why not restore four-track running through the stations on the Chiltern line? I thought they were when the line was closed for a whole week or so a couple of years ago, but no, just some kind of minor realignment. boardings around the pub tells me that another Tesco express or local is being created. The Black Dog survived for some time on being close to Kempton Park, a horse racing venue, and claimed to be last pub en-route from the M25 – trueish – there was/is a closer pub to the race course, but not if you take the first entrance to the racecourse on that route. The Black Dog is on a junction of a lesser and a major road, and at the end of an arcade of mixed shops. There isn’t another supermarket in that parade, although there are shops that probably sell groceries. The competition is likely to be from a couple of petrol stations – BP with their M&S mini-store a couple of junctions further up, and a closer, smaller petrol chain with a smaller grocery section. Closer to Kempton Park is a big Tesco supermarket and a small M&S Simply Food. Parking and road access may be more difficult for Tesco here. Being a dual carriageway main road, those heading away from Kempton Park have to get into the filtered turn-right lane – not the easiest in existance. There isn’t an obvious candidate shop for closure when Tesco opens, unlike the Budgens when Mini Sainsbury’s opened on the ‘Green Man’ site, or the doomed looking Costcutter almost next-door to the now being built Tesco in Tescoville. So yet again I ask – why is it always Tesco?